Another heart touching story written by no one less than my personal roomie in Green Yoga India. Let me introduce: Marsha, the red hairy, bubbly and life loving adventurer of New York. 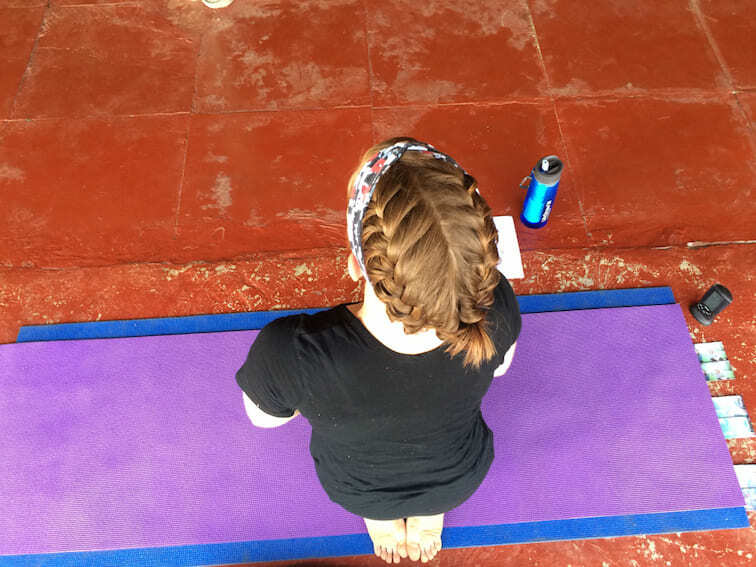 Today she shares with us her personal yoga story, she wrote a year ago in India. Enjoy and get inspired. The room was mind numbingly stuffy. An aroma of sweaty feet filled the air. The teacher was on an elevated stage with a head-set microphone. An oscillating fan sat behind her. Every 15 seconds or so, the fan head would turn towards her, rendering her voice horribly robotic. To my left, a women in her late 60s wearing tube socks was fighting a losing battle against her gas. To my right, my adventure buddy was growing weaker trying to hold in her laughs more successfully than Betty Boop over there could hold in her farts. The wall in front of us was lined with cracked mirrors, allowing us to gaze into each other’s eyes at the most awkward of moments. Behind us, full floor to ceiling glass walls creating a fish tank effect for every curious gym goer. Faint sounds of techno music and thumping treadmills crept into our space, miraculously overpowering the plinky-plunky music coming from the teacher’s sad little iPod. I was sure I was doing everything wrong, and I never felt less graceful in my whole life. This was my first yoga experience. I was sure I was doing everything wrong, and I never felt less graceful in my whole life. This was my first yoga experience. Somehow, I survived this traumatic event, and continued practicing yoga intermittently over the next five years. I would go with a friend, but never really on my own. I was never fully convinced it was for me. I always associated “working out” with competitive sports, or running, or some kind of boot camp class. Yoga? I wasn’t sure of the point. But still, I would give it a try here and there. This winter, yoga found its way into my life again. I ended up back in New York in my childhood home, numb from an overload of emotions I didn’t know how to deal with. My plans of traveling and creating a life with my partner were halted. He went his own way, and I had to decide what mine was. I was extremely dismissive and quick to change the subject whenever questions about my life were raised. The thing I was most certain of became a blur. I withdrew. I became a total introvert. I was not myself. After the holiday season, I joined the local gym and started running again. I needed a distraction and was open to anything that could help. It felt nice to be exhausted physically instead of emotionally, but still it wasn’t scratching my itch. They had flyers at the gym for group classes. Cycling, kickboxing, zumba, and of course, yoga. I decided to give it another try. What else did I have to lose, right? I arrived a few minutes early for the 8am Tuesday class. The teacher was off to the corner balancing on one foot with closed eyes. A few people trickled in and laid down. Mirrors to the front, glass windows to the back. Uh-oh. I thought about leaving. He started to direct the class towards the front of our mats. There was no turning back. His voice was calming. His instruction, very clear. His adjustments, helpful. No silly music. No microphone. No gimmicks. Between each pose, he gave us words of encouragement. He was saying all the right things. Do not judge yourself. Do not judge others. Focus on this moment, and this one only. Inhale new beginnings. Exhale all that you don’t need. Be patient. Relax. Smile. I held back tears with every one of his statements. How did he know that I needed to hear all of this? Each class made me feel physically energized and emotionally cleansed. I attended every session that I could. For that one hour I could turn off my brain and work towards something positive. Finally it clicked, right when I needed it most. Inhale new beginnings. Exhale all that you don’t need. I craved more yoga. I wanted to learn everything about it. More than anything, I needed to step away from my life to focus on myself. It’s something we rarely get the time to do, but I happened to have the luxury of time. And whether I liked it or not, a total lack of commitments. 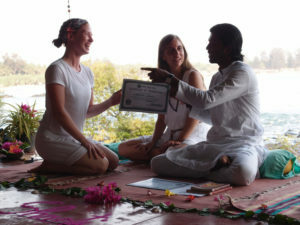 I began looking at yoga teacher training programs all over the world. Diving in head first seemed like the only logical option. I had no real background in yoga, and I was pretty out of shape, but oh well. It excited me. Thought bubble to ticket purchase spanned three days. I figured if I was going to immerse myself in yoga, I might as well do it in the mother land: India or bust! So here I am now, on a beach in South Goa, pushing myself farther than I have in a long time. Each day is packed solid with practical classes, theoretical classes, meditation, and an insane amount of sweating. The group of us, 15 yogis from all around the world, were brought together by a common interest; to learn. What a beautiful thing. It’s been six years since I graduated college, and to be buried in notebooks and manuals again feels wonderful. I’ve learned that yoga is so much more than stretching in a room of brightly colored mats. It’s a way of life. I’m thankful every day for my horrible introduction into yoga, because somehow it got me here. This winter, I wanted a quick fix to rid myself of painful emotions, but one of those doesn’t exist. Time passes and we hope to heal. With yoga, I know that I am making an honest effort to better my mind and my body to help me through this challenging chapter, and all others that may come my way. There is no end to this story. There is no finish line. There is no award for the best asana. And that’s ok. I found yoga, and with it, a better version of myself. Each day I can wake up happy knowing there is still more to find. Thanks Marsha for her honest words. The original article you find on Marsha’s blog: someginger.com. If you can connect with Marsha’s experience or have your own story to tell. We want to hear it! Or simply leave a comment right here below. Share with us your thoughts and opinion in the comments!